Serving the Island as one of the major attractions for tourists, Pasikuda is identified as one of the safest beaches on the Island by many tourists. 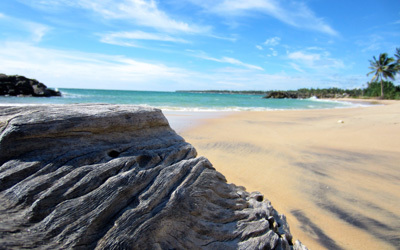 Pasikuda is located in the Eastern province of Sri Lanka. The name “Pasikuda” was derived from the historic meaning of “The Cape of Moss”. This popular tourist destination of Pasikuda is just 35 km away from the main city of Batticaloa. The beach of Pasikuda is one destination no tourist would miss for its opportunity to enjoy at a crystal clear beach with a scenic view throughout. Pasikuda Bay – Bay of Pasikuda is one that nature lovers have always admired for years for its unique attraction. The outer bay draws the attention of the scattered coral reefs fringed within which possess many other coral communities. One of the best and most popular reef systems in the East of Sri Lanka was also proposed as a Marine sanctuary. Water and Beach Games – At Pasikuda one cannot just relax on the beach having access to so many entertaining beach games. Get in to the blue water and enjoy many water games as swimming, water skiing and wind surfing. Catch the view of some tropical fishes and crystal coral reefs. The combination of Kalkudah and Pasikuda beaches form an excellent and exquisite blue and calm waters for one to enjoy a fresh dip. Batticaloa Lagoon – The Lagoon of Batticaloa is a must for any tourist hanging around to pay a visit before leaving this Island. The lagoon which is in close proximity is just about 32 km away from Pasikuda. Within the lagoon of Batticaloa comprise of many Islands named as Buffalo Island, Puliyantheevu Island and Bone Island which are connected with long bridges from the Lagoon for visitors to enjoy a visit. The Kallady lagoon owns the biggest bridge connecting to one of the Islands named as, “Lady Manning Bridge”. Batticaloa Dutch Fort – Having had fun at the Batticaloa Lagoon shouldn’t keep you away from visiting the Old Dutch fort of Batticaloa. The fort which is believed to have built in 1628 by the Portuguese, got it name “Dutch” after having captured by the Dutch ten years later. The fort which is located on the heart of Batticaloa town; Puliyanthivu Island is bordered by the lagoon from two sides and has a square structure. The plan for the fort is to be transformed in to a museum and a conference hall in the long term. Archaeological excursions at Polonnaruwa – Let your trip to Pasikuda be added with one of historical memories by paying a visit to Polonnaruwa, one of the major heritages sites which was ones an Ancient kingdom of respectable and honorable rulers in the country. Enjoy a drive of about one hour approximately to the heritages city of Polonnaruwa from Pasikuda. The ancient city is opened to visitors to explore the remains and ruins of royal palaces, gardens, statues, temples and many other religious buildings the city beholds. In 1982, a scenic location of Polonnaruwa was captured in the music video called Duran Duran. Whale watching in Trincomalee – Wouldn’t it be a great opportunity to witness some of the great Whales and Dolphins who dance and play in the Sea. Not very far from Pasikuda, in the beach of Trincomalee, visitors could enjoy and experience the great opportunity to witness many Dolphins and Whales. During the season between March to August every year, Trincomalee has been rated high in spotting Blue Whales, Sperm Whales and Spinner Dolphins. Capture these unforgettable memories to take back and remember what excitement and fun you had during your time at Pasikuda. Minneriya National Park – The trip to Minneriya National park would be a little distant from Pasikuda about 79 km. your experience at Minneriya would be exciting and beyond words for it’s truly exciting. The national park of Minneriya which was identified as on in 1997 to protect the surrounding wild life is now one of the most popular tourist attractions and one of the best wild life sanctuaries in Sri Lanka. Wild elephants are prominent throughout the park during the season. And other wild elephants and endemic species are seen in the park during the season. Ayurveda Spa Treatments – All tourists have great access to experiencing the unique Ayurveda spa treatments and many treatment centers. At the spa centers, you will be exposed to a whole different experience for life time as you will be treated with the most exquisite and ancient herbal ingredients. Get yourself a body wrap, a body and head massage, oil treatments or any healing treatments as your prefer. Listen to the soothing music and relax as you are treated with the best herbs ever. Pasikuda, undoubtedly would be a thrilling experience in your entire tour experiences. Having offered you with the best beach vacation on the Island, one can relax to heart’s content. Leave behind every stress and enjoy the moment at Pasikuda. Meet new friends and enjoy while at the same time experiencing a whole different and mouthwatering varieties of cuisines. Let the blue waters of Pasikuda drive you to an imaginary destination you’d hope never to return. Let us make your vacation even more interesting by letting us your preferences as we will cater all your needs and demands right away!